The darkest and largest knife SOG has produced to date - The Midnight Tigershark. 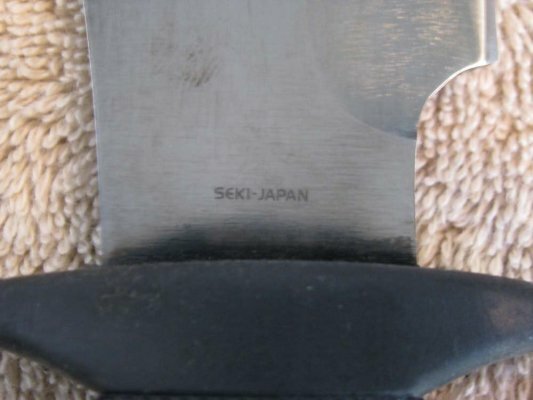 Blackened and forged in the heart of SOG's manufacturing plant in Seki, Japan, this knife was an exclusive production run for the "Cutlery Shoppe" knife company in the late 80's, along with the 'Nite Tech'. 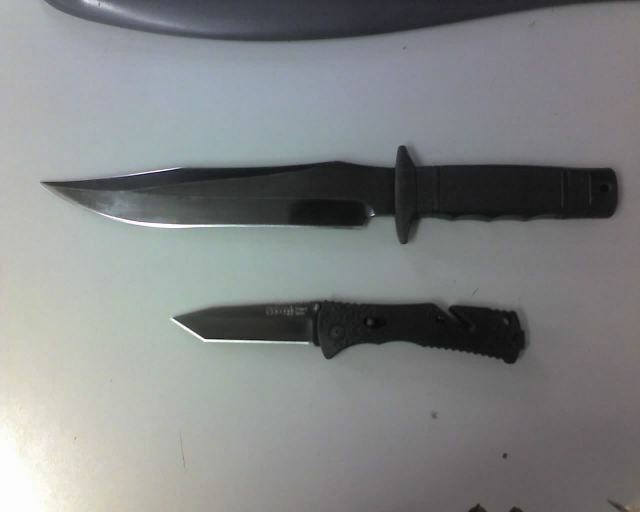 Its production ran side by side with the satin-finished Tigershark in SK-5 steel. It is identical in every aspect to the Tigershark SK-5 except that it us gun-blued. Under the gun-blue coating lies a satin-finish, which explains why the Midnight Tigershark does not have a shiny mirror surface like the S1 Bowie. It instead has a blackened finish that has low reflectivity and increased resistance to the elements. This knife is a winner from SOG, but sadly it is not appreciated much till after it was discontinued. Not many large bowies are gun-blued, and the Midnight Tigershark is one of those rare ones with a "tool look". It is not very easy to get one of these nowadays - quite a rare find since it was exclusive and produced in limited numbers. Most people would not have known about the SOG Midnight Tigershark if not for our SOG Collectors site. Having been discontinued for more than 12 years, it is highly prized among collectors. Even more difficult to find one that is Mint in Box (MIB). 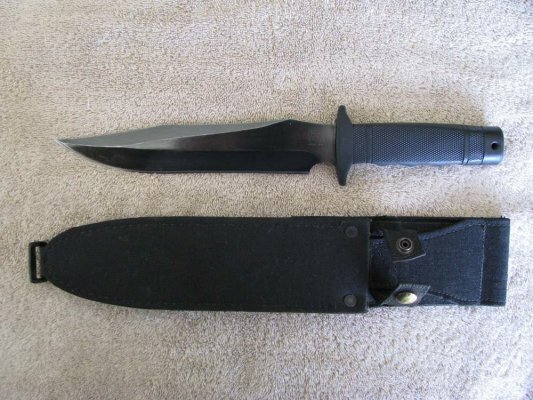 It is also considered rare because it is not known whether it became a regular production model from SOG. 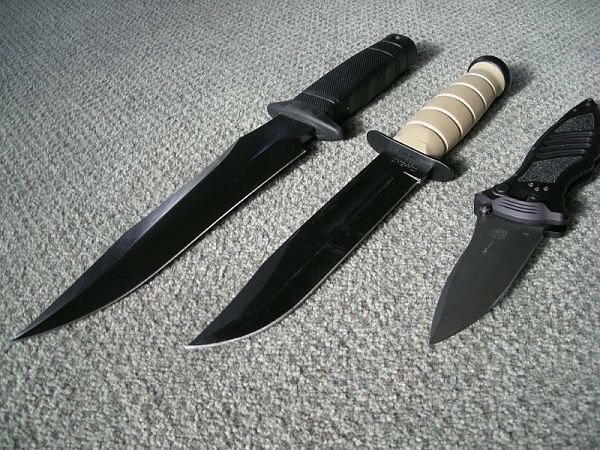 The Midnight Tigershark remains as one of the most sought after knives in the SOG knife series as well as the other Tigershark models. 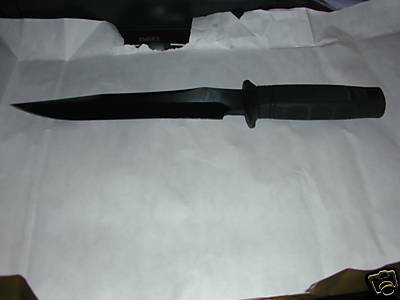 Blade Length: 9 in. x .250 in. Limited run? : Yes, only for Cutlery Shoppe. 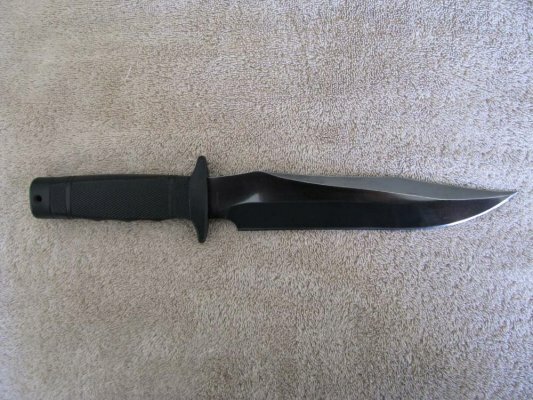 Other things of interest: Largest gun-blued fixed blade ever produced by SOG. 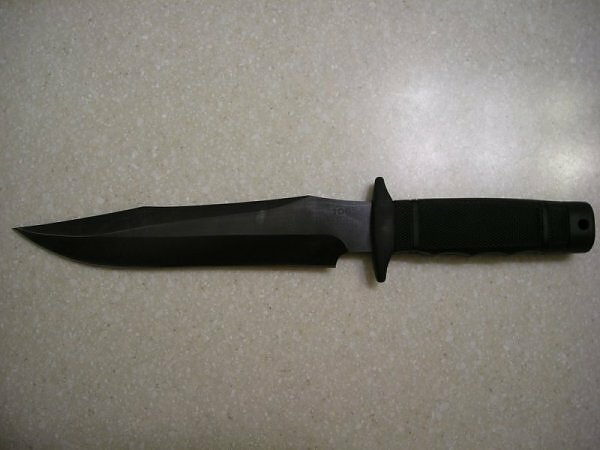 3 - Has been around for at least 2 years and are selling reasonably well, with retailers favouring other newer models /ver this knife. The latest from SOG Specialty, made exclusively for Cutlery Shoppe.We took the highly acclaimed SOG Tigershark and made it even better. Our new Midnite Tiger features a gun-blued carbon steel blade, Rc 55-57, with a faceted reinforced tip and a special "rolled edge". 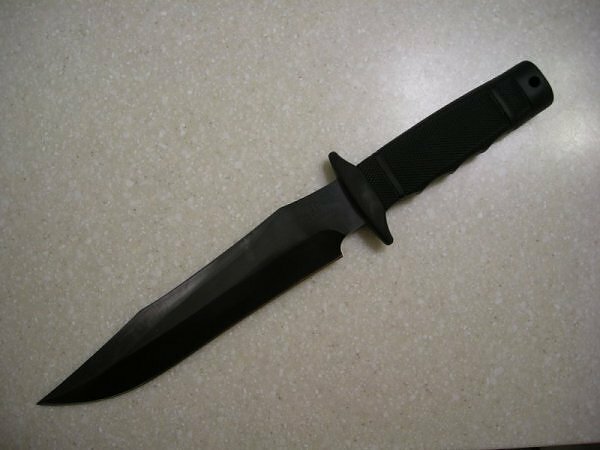 The gun-blued carbon steel blade will resist corrosion and still retain the keen edge that quality carbon steel is known for. 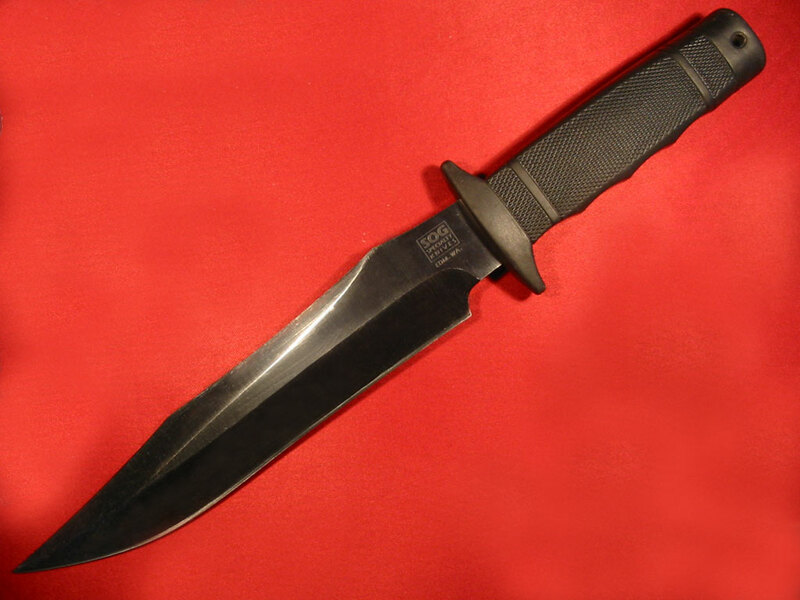 The Midnite Tiger also sports a full tang construction and an ergonomic Kraton handle for comfort and reliability. 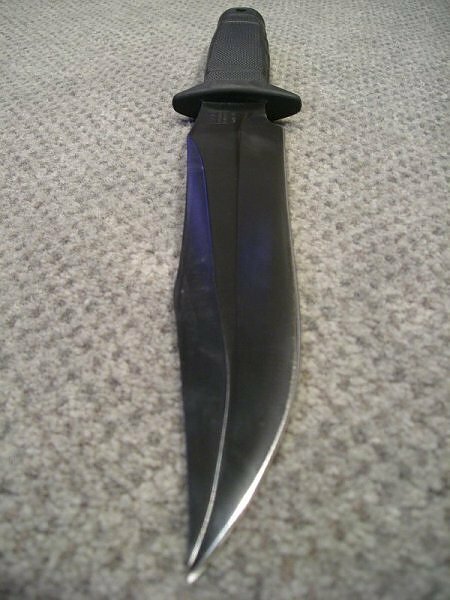 To top this off, we have included a custom black Condura sheath from famous sheathmaker and knife designer, Blackle Corrs. This condura sheath includes a thigh tie-down and a Bianchi belt Mil Spec belt fasterner to accommodate military pistol belts.